Language users need to interpret others’ subjective opinions in communication. In causal relations, subjectivity is defined as the involvement of a speaker who is responsible for the causal reasoning. Subjectivity can be expressed by various linguistic cues such as perspective markers (e.g. I think, it is said) and modal verbs (e.g. may, must). 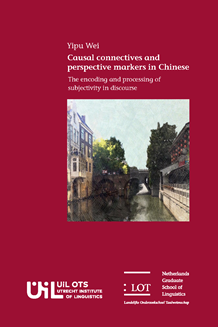 Some connectives encode subjectivity as well – the Chinese connective kejian ‘so/therefore’ and the Dutch connective dus ‘so’ indicate that a causal relation is based on the subjective reasoning of the speaker. These linguistic cues function as instructions for comprehenders in on-line language processing. This dissertation explores the use of linguistic markers expressing subjectivity in discourse and how these markers influence the representation and processing of discourse. Three different methods were applied to Mandarin Chinese: a collocational analysis, an on-line reading study and a visual world paradigm eye-tracking study. The results show that linguistic cues such as perspective markers and modal verbs are used in combination with connectives to express subjectivity in causal relations. In on-line reading, these linguistic cues function as processing instructions to readers – helping them track the source of information and interpret subjectivity. Moreover, this process is highly incremental. An eye-tracking study using the visual world paradigm provided evidence about how subjectivity influences processing: the processing of subjectivity involves activating the source of information in the mental representation of the linguistic input. Combining these three methods has proved to be a fruitful way of gaining more insight into the phenomenon of subjectivity.